Serving breakfast lunch and dinner every day of the year to anyone seeking a meal, no questions asked. Real food served restaurant style on real plates allows each guest to dine with dignity. 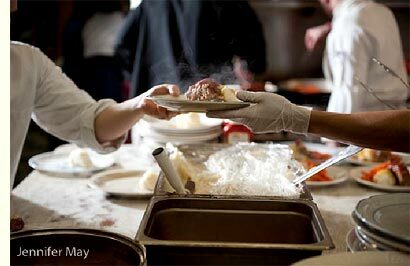 The soup kitchen is funded exclusively by donations, both private and corporate. We accept not a penny in government funding that would require proof of poverty before someone is served a meal. Anyone hungry enough and humble enough to cross the threshold to ask for a meal will be served. Food supplies come from donations via Hudson Valley Second Harvest food rescue, partner restaurants, the regional Food Bank, area farms, and from our own urban gardens in the city of Kingston. Every dish is a display of the respect we have for the farmers who produce our food, the chef and volunteers that prepare it, and the guests who will be dining. For food donations contact Kim Prottas, Culinary Director (845) 338-3468.